Ken Doll Vintage Clothes 1961 - Flock haired Ken first came on the market in 1961 as Barbie's man and companion; he's 12" tall and he too has a great wardrobe of tailored suits and sports outfits so he can accompany Barbie in style. Ken had nine outfits to choose from in 1961, plus his original red swimsuit. For larger photos, full descriptions, click here. Ken Doll Vintage Clothes 1962 - Ken has a new look this year with painted hair. Three new outfits were added, all nine from the previous year were repeated. New were eleven Pak items, that included fewer accessories. Ken Doll Vintage Clothes 1963 - Nine new outfits were added, six Pak items, plus repeats from previous years. For larger photos, full descriptions. click here. Ken Doll Vintage Clothes 1964 - Twenty new outfits, matching travel costumes for Ken and Barbie, twelve new Pak items, plus repeats from previous years. Allan doll was added this year, Ken's buddy and same size doll 12" tall. For larger photos and full descriptions, click here. Ken Doll Vintage Clothes Fashions 1965 - Ken and buddy Allan got six new outfits this year, four outfits from prior were slightly different this year. For larger photos, full descriptions. click here. 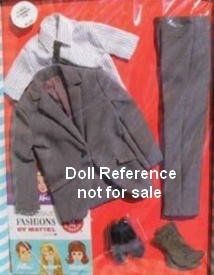 Ken Doll Vintage Clothes 1966 - Ten new outfits were available, twelve Pak items were repeated. For larger photos, full descriptions, 1966-1967 click here. Ken Doll Vintage Clothes 1967 - Only one outfit was available for the Ken doll, it was sold thru Montgomery Ward and made by Marx; a Braniff Pilot uniform which co-ordinates with Barbie's Braniff airline Hostess (4) outfits. 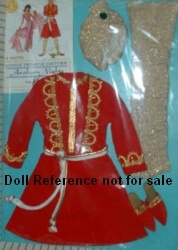 The 0750 Ken doll was available through 1968, however no new clothing was introduced. An updated Ken reappears on the market in 1969, with a new head mold, a bigger body physique and new wardrobe to fit his larger size. For larger photos, full description, 1966-1967 click here.